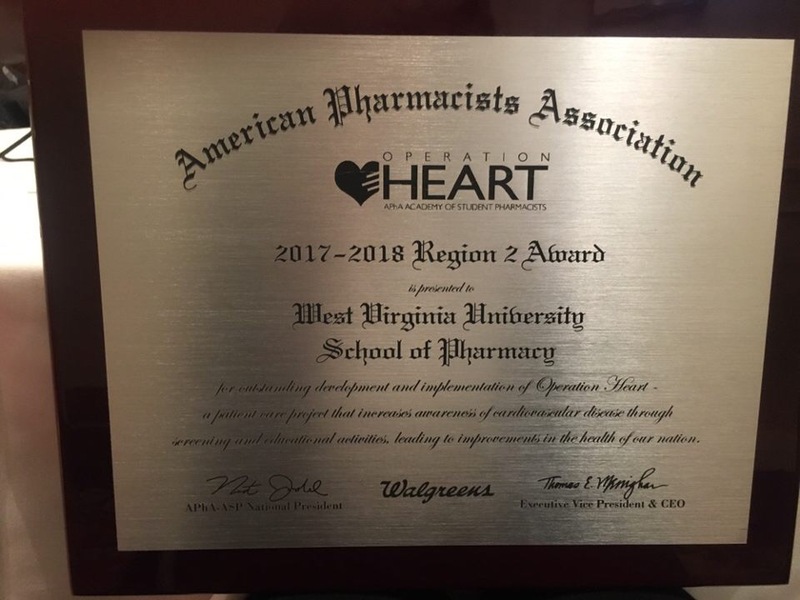 Congratulations to the WVU School of Pharmacy’s Chapter of the American Pharmacists Association – Academy of Student Pharmacists (APhA-ASP)! They earned the 2017-2018 region two award for Operation Heart activities. The award was presented this weekend at the association’s Midyear Regional Meetings in Baltimore, Maryland. Operation Heart, a program to create awareness of cardiovascular disease, was launched as an official APhA-ASP National Patient Care project in 2010. Through participation in Operation Heart, student pharmacists work in their communities to encourage lifestyle modifications, monitor associated risk factors and provide education about medications for heart disease. APhA-ASP Region two includes schools of pharmacy from West Virginia, Pennsylvania, Virginia, Washington, D.C., Maryland, Delaware, and New Jersey.